#310) Who Needs Malcolm Gladwell When You’ve Got Joseph Campbell? The currently somewhat-embattled Malcolm Gladwell (lotta sniping around his newest book) was on The Daily Show last night. You could sense Jon Stewart radiating a bit of skepticism. And the fact is, Gladwell’s theme for this one — that he was “struck” by how many successful people succeeded because of being disadvantaged in some way — is just an extension of what Joseph Campbell identified long ago — that you would expect successful people to tell their stories from the perspective of the disadvantaged or flawed hero (also known as Element #2 in our Connection Storymaker app). SOME BOOKS ARE BETTER THAN OTHERS. If Gladwell had studied his Joseph Campbell he might not have been as “struck” by the success stories of world leaders. I’m a huge, life long fan of Malcolm Gladwell, but by now most people have figured out he’s not perfect with his essays. For example, he opined in the New Yorker that, “The Revolution Will Not Be Tweeted,” just a few months before the Arab Spring revolutions were tweeted like wild. Roops. As a long time fan, I think his book, “Blink,” is one of the most powerful and profound communication essays of modern times, even if it feels like only the start of a major work. He’s great. But his new book, “David and Goliath,” has generated lots o’ blowback such as the lousy reviews summarized by The Guardian and others. Definitely not his best work. MG: I got started on this book because in my last book, “Outliers,” I was spending a lot of time talking to very successful people and I was always struck by how often when they accounted for what they had achieved, they began with the difficulties, not with the obvious advantages. Dorie Barton and I are living and breathing “The Hero’s Journey” these days with the release and implementation of our Connection Storymaker app. 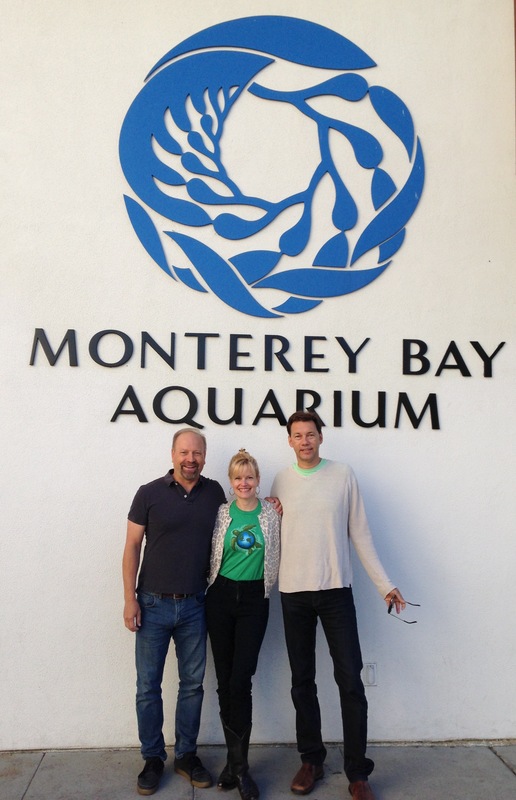 Last week week did our first full workshop with it at the Monterey Bay Aquarium. Next week we’ll be demo-ing it in Washington D.C. at an EPA conference on Child Heathcare Centers (where I’m giving a keynote), in a workshop at Union of Concerned Scientists, and at AAAS and NAS. At the core of the app — it’s most intricate and intriguing element — is Dorie’s 9 element template for Joseph Campbell’s “Hero’s Journey.” Element number 2 is “the flawed protagonist,” with Element number 7 being, “the lesson learned,” which usually relates to the flaw. It’s a sort of problem-solution combination. More to the point, how did he expect them to tell their life stories, “I was raised with a life of privilege AND I never had any serious challenges AND I succeeded.” The Hero’s Journey predicts that even a rich kid will point to his ADHD as a monumental life challenge in the making of a good story. And we’ll go with it, preferring to hear a good story. But Gladwell, ever the storytelling opportunist, saw publishing gold in his not-so-novel observation, and now has to endure the skepticism that comes from the brilliant minds of people like Jon Stewart. Though he should be thankful he’s not Katherine Sebelius who got the roasting of a lifetime last week in her Daily Show interview. Yeeks! THE BULLOCK’S JOURNEY. 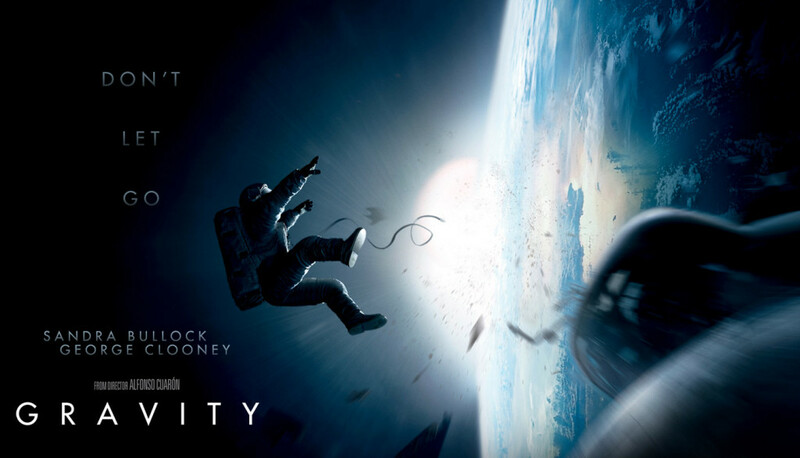 The wonderful new movie, “Gravity” is a textbook demonstration of the Hero’s Journey. Download our Connection Storymaker app, open up the PARAGRAPH section and you’ll be able to spot all 9 elements in the movie. It was only a little more than a year ago that Dorie brought the Logline Maker into our workshop as I was grumbling, “yeah, right, we’ll see about it.” I was skeptical. It sounded too “Hollywood” with the terms protagonist, hero and antagonist. But it’s been an amazing year of workshops and I’m a different person. Yes, it is that simple. The movie has a relatively simple story, yet in classic fashion, you can find enormous complexity in it. And does the Hero’s Journey really work for “Gravity”? Um, gee, let’s see … 97% positive reviews on Rotten Tomatoes and #1 at the box office with $43 million. Yeah, I think maybe there’s something to this Joseph Campbell stuff. Go ahead. Do it. You know you want to. Download the app then see if you can spot all 9 elements of “the Logline” (which is the PARAGRAPH function) in the movie. It’s a fun game to play. Then write your own story with the app! And lastly, I end our book by talking about simplicity as “the ultimate sophistication.” You want to see that in action, just watch “Gravity.” There’s pretty much only two actors. Is that the definition of simplicity or what? More importantly, the core of the story was pretty simple. You don’t leave the theater feeling like, “Wow, I need a few hours to digest this thing.” You leave feeling very satisfied, like, “I Got it.” And you think you’re done with the process. But because it’s so easily absorbed, you later find your mind drifting back to the movie and pulling new things out of it. Out of simplicity arises complexity. The makers of this movie knew this very well. Yeah. There is that one little problem. Oh, well, even Neil gave in and praised the movie for how much it did to connect the public with what’s going on in space these days. As we talked about a month ago with Andy Revkin, telling accurate good stories is tough. This week we ran the 7th iteration of our Connection Storymaker Workshop with 32 staff of the Monterey Bay Aquarium. What a great experience. Nothing like working on storymaking with folks who are already great storytellers. This was our first experience where we had participants using the app in advance of our arrival, giving us some clues on their “storytelling culture” before we got there. Veddy interesting. BROCCOLI, STEAK AND PEYOTE BUTTONS. Gotta read the book to know what that means. Of course the answer was, “lots.” Storymaking, Storybreaking and Storytelling is an endlessly challenging process for which nobody is really that great, though lots of people think they are. But just look at the very best people in Hollywood who are paid a fortune, spend their lives working on the craft, and still produce the occasional clunker. My sales rep for Flock of Dodos wrote a popular essay years ago where he talked about how if you spend $1 million dollars hiring a crew to build a house, when it’s finished, the house is probably going to be worth something close to that amount. But when it comes to movies, you can spend a million dollars to build a movie, yet end up telling a boring story that leaves you with a piece of junk that is literally not worth ten dollars. It happens all the time in Hollywood, and at much larger scales. And it happens at smaller institutions. Yeah, right. If you think you are, then you probably are indeed done with the learning process — good luck to you. Story is endlessly elusive. The best you can hope to do is build a “storytelling culture” within an institution where there is the development of an inutive feel for story and attention to the need for on-going practicing of story. Which is where our new app fits in — we’re increasingly viewing it as something akin to a “Thighmaster” — meaning a workout device that really ought to be used on a weekly basis, if not daily, to help you keep your storytelling chops up. It has to be an on-going commitment. There is no, “one and done,” when it comes to storytelling workshops (despite what those people at that science institution thought). We had a very cool thing happen with this workshop. We had the participants download our Connection Storymaker app a couple of weeks before we arrived, fill out a WSP for a story they wanted to work on, then email them to a set address a few days before we got there. The results were fascinating. This was the first time we had a snapshot of the “institutional story culture” before arriving. Without going into detail (a trade secret for us now), we were able to look at the WSPs of 23 of the participants in advance and pull out some actual quantitative indicators of how the people at this institution tell stories, BEFORE we got there. The result was we were all “talking story” before the workshop even started. Which is a significant step up in sophistication from how we started this workshop just a couple years ago. All of which means we are engaged in a process that continues to build on itself. And was perfectly matched with the Aquarium folks — particularly the group involved in developing their upcoming, “Tentacles,” exhibit about cephalopods. Great folks, great stories, and a great time. They left us with a lot of interesting thoughts on how we run the workshop. We left them with the app, which I think was a pretty good trade. 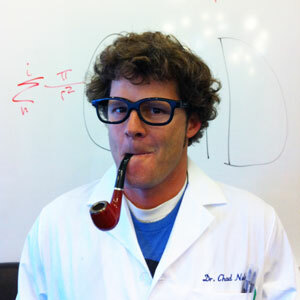 Dr. Chad Nelsen of Surfrider Foundation is one of the best guys I know when it comes to communicating environmental issues broadly. This is a real gem from him. GIVE US THE TRAILER, NOT THE ENTIRE MOVIE. Leave it to a surfer to crack the nut of how to make the most effective presentation. It’s a brilliant rule of thumb. At the core of our new book, “Connection: Hollywood Storytelling meets Critical Thinking,” is one word: simplicity. That is what effective broad communication is about (as well as most every other major challenge in life) — Keeping It Simple Schtoopid. A year later, and thanks to the combined efforts of some of the world’s top surf photographers (who donated photos), professional surfer Pat O’Connell (who provided narration), San Diego City Council Member Donna Frye (who told a great childhood story of the oceans), and Jack Johnson (who let us use his song, “In Times Like These”) we came up with the 4 minute video, “Shifting Baselines in the Surf” — one of the best videos of all for our Shifting Baselines Ocean Media Project which is still worth viewing 8 years later. It all started with Chad’s communications savvy. That’s it. So simply put. THAT is the goal of these big talks. And the very trap that academics can’t seem to resist — they want to tell you the WHOLE story. And when I say “they,” I actually mean “we” they — as in I’m one of the worst offenders — constantly looking at my Powerpoint slides like they are all my precious children who must be brought along on the journey. But they can’t. “You’ve got to be willing to kill your darlings,” is what writers are fond of saying. I’m not sure I like that expression so much, but I REALLY like Chad’s trailer rule. That’s the bottom line. A good movie trailer makes you want to see the movie. A good talk should make you want to grab the speaker afterwards to hear more, rather than making sure you dodge him at the reception for fear he will pick up where he left off when the moderator told him “You’re done,” in the middle of a sentence. So give Chad’s little rule of thumb some thought the next time you’re assembling a talk. Trailer. Not movie. Movie comes later. Movie is in your written paper or book. Trailer is for talk. Your audience will love you for it. 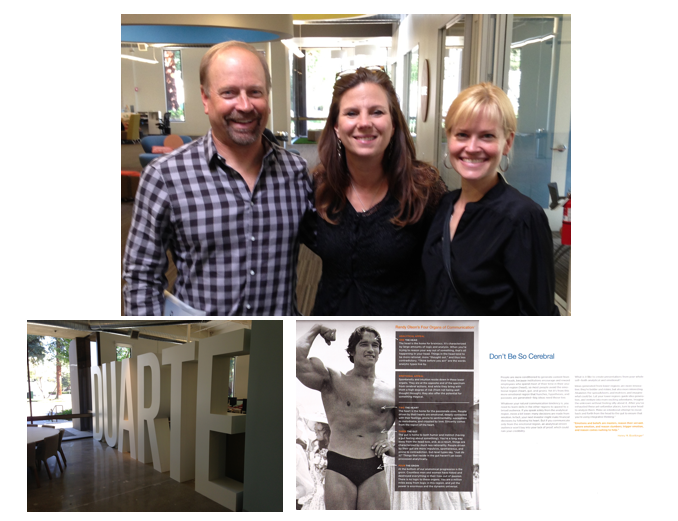 Dorie and I traveled to the Bay Area to spend a few hours with Nancy Duarte. She’s the bestselling author of two books on communication for the business world, CEO of her own company with 100 employees, and pretty much the top expert on how to give a good presentation. Oh, yeah, she’s also a lot of fun! Couldn’t agree more with that comment. I remember looking at Tufte’s books long ago and thinking, “Gee, cool illustrations, but … how do you actually use this stuff.” Duarte’s books combine both the style AND the substance of how you actually apply what she’s advocating. And that explains her enormous success in the business world. Her company makes over $20 million a year and her TEDx talk has gathered over a million views. She is kind of the gold standard for presentation skills. And best of all, she’s really smart and fun to talk with. I’d been wanting to meet her since 2010 when she included two pages in “Resonate” about my book, so last week when Dorie and I were in the Bay Area for other stuff we scheduled to stop by for a couple hours chat. She’s as great as her books.